We've been feeling so humbled, energized, and downright filled with hope by the youth movements across the globe to protest climate change inaction. 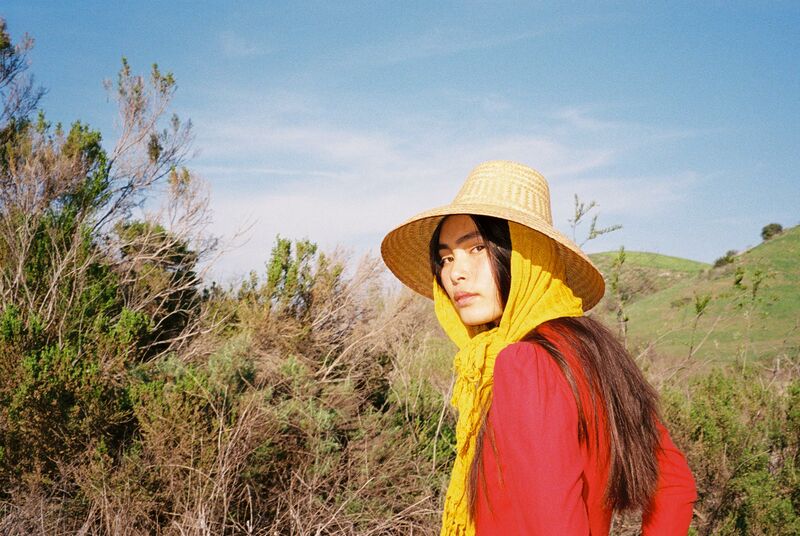 Inspired, we sat down with Lily Yeung, an 18 year old activist, student, model, and artist to talk about fracking on ancestral lands, how to get involved, and how she's been working since the age of eleven to change the fashion industry. Can you give us a little intro to you and talk a bit about your background? So, I am 18, I am passionate about protecting the environment, I love fashion, and want to combine my commitment to the two going forward in my studies, projects, and the way I choose to live my life. I’m currently finishing my studies in costume design for theatre and transitioning to studying fashion with an emphasis on sustainability. Fashion is one of the most detrimental industries for the Earth and I want to do something to change that! We’re so excited when we meet women like you who are making the environment and sustainable style a priority – can you tell us about how your interest in vintage came about and more about the work you do in fashion? We saw recently you were deconstructing thrifted sweaters and repurposing the yarns – tell us a bit about that and what other textile explorations you’re doing right now? I’ve also been experimenting with making paints out of found earth, which I recently applied to a painted jacket I designed, using pigments I found and ground on the Navajo reservation. It’s truly magical to be able to capture the colors and essence of a landscape on a garment. In addition to that project I’ve also been exploring crochet as a medium for intuitive sculpture which has been a very meditative practice for me and I’ve really been enjoying the tactile nature of crochet as a medium. How does this interest in the environment and sustainability play out in your everyday life? It’s something that I always try to be conscious about, whether its choosing to walk or bike somewhere instead of drive, bringing reusable utensils/bottle to cut down on single use plastics, or buying from the bulk section and fresh produce area to cut down on packaged products. I really believe these small choices we make can make such a big difference. I also think this way in regards to sourcing materials for projects, upcycling thrifted finds and trash, or foraging for dyes and materials. You’ve been referred to as an activist and we know that you are especially involved with the issue of fracking on the Navajo land. Can you tell us more about that and in what ways you’re involved? My ancestral lands are near Chaco Canyon, in an area called Bisti / De-Na-Zin Wilderness in the high desert of New Mexico. This sacred land on the Navajo reservation is being leased out for oil and gas extraction, with more than 11,000 acres which BLM is leasing in March for fracking. The local communities are already suffering health issues from the drilling that has already started, so it’s crucial we fight to save this region from more development and protect the sacred lands of Chaco Canyon. A great way to help is by talking about these issues and spreading awareness. Frack Off Chaco and Indigenous Environmental Network are some great organizations to support for this crisis. So many of us have great intentions and do care to help when we believe in something, but often don’t know where to begin. We like to ask those that are already in the thick of things – If someone reading this is wanting to get involved, do you have recommendations for how to do so? Don’t just talk about it, take action. Show up. Be part of the change. We can’t expect other people to solve the problems we face in our future on this planet, we have to be part of the change. Whether it's showing up for a protest, being conscious of the way your everyday actions affect the environment, or raising awareness or funds for a organization that’s fighting for a cause you believe in. What are you especially excited about these days? Any new projects on the burner? I’m really looking to expand my knowledge of plant dyes, a subject I find incredibly fascinating! I have also been working on a large-scale crochet wall hanging repurposing deconstructed plastic bags and found organic materials that I’m really excited to bring to fruition. We usually wrap up on a light, fluffy note – any beauty rituals, products, secrets up your sleeve that you’re willing to share? I always like to start the day with a cup of hot water and lemon, I think it’s a really great ritual to have every morning to prepare for the day and also helps balance out your PH, and for me it has really helped to keep my skin nice and healthy. As for products, I like to keep it natural and simple. I love the Thayers brand rosewater toner which has witch hazel in it, a natural astringent that really helps when my skin is breaking out. Also Fat and the Moon makes really great moisturizers and lip tints, I use the aloe lotion and lip & cheek stain a lot! And if you want to get DIY, I make my own hair rinse with apple cider vinegar and rosewater, it makes my hair so soft and shiny and you can keep it in a nice little glass bottle. I reused an old olive oil spout just to control the way it pours out. Follow Lily @lily.yeung. Photographed by Kate Parfet in Wood Canyon, California.